Hugh D’Andrade is famously indiscriminate about the uses of his art. It has appeared on book covers, magazine spreads, rock posters, Burning Man paraphernalia, board games, as well as the occasional t-shirt and skateboard. His greatest ambition in life is to project his mental images into the minds of innocent people everywhere. Hugh shares with us some of his favorite images and tells us in ‘His Own Words’ why. 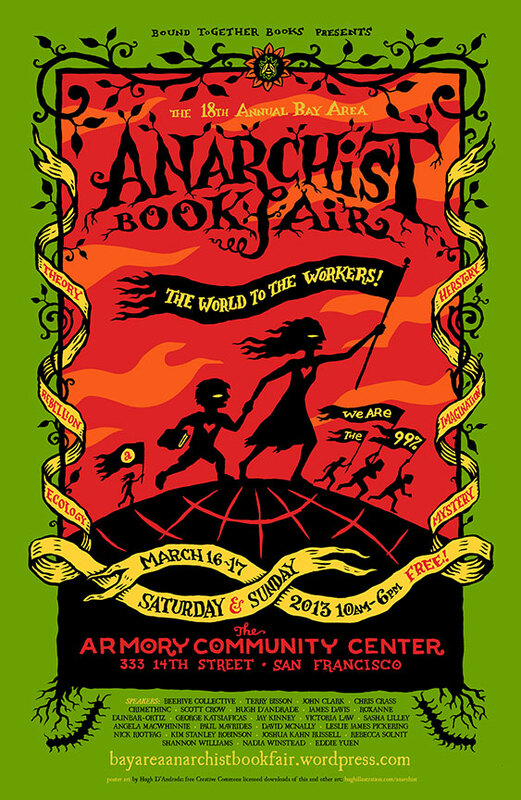 HD: Anarchist Bookfair poster: I have done a poster for this event for years — in fact, this is my 10th and final poster. It seems I have finally run out of things to say about anarchism! At the event, I gave a slide show about my political work, this poster series, and the common problems faced by political artists. HD: I had a bike accident in October of last year, and I’m still recovering! I broke my left shoulder and my right elbow. Miraculously, I was able to continue working, but I have had to face some pain and hardship for many months. I did this image as a commemoration of the accident, and as a gift for the many friends who helped me get through the ordeal! HD: I also did a limited color version for use on t-shirts — which I am selling as a benefit for my mounting medical bills! 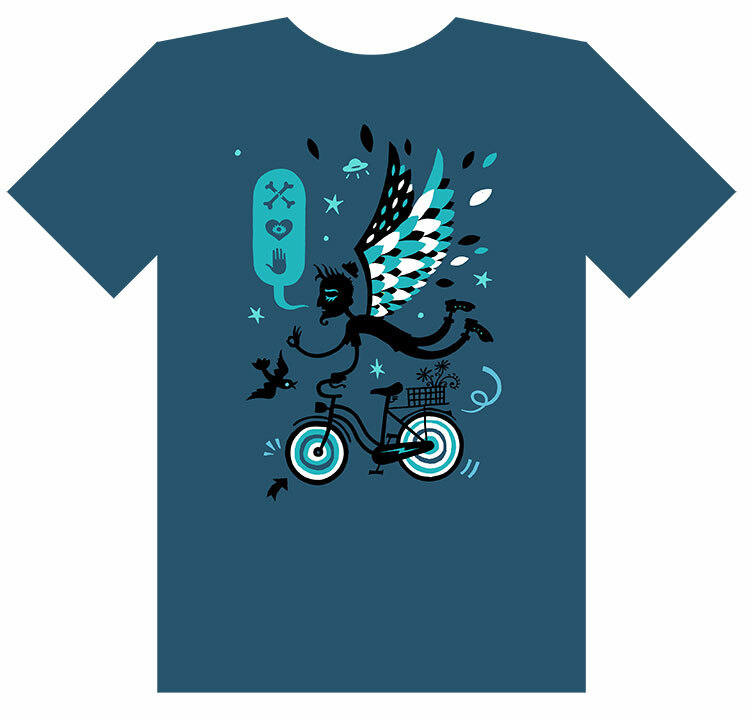 Available here: https://www.etsy.com/listing/125510531/accidental-angel-shirt? HD: I seem to do a lot of bike imagery lately. 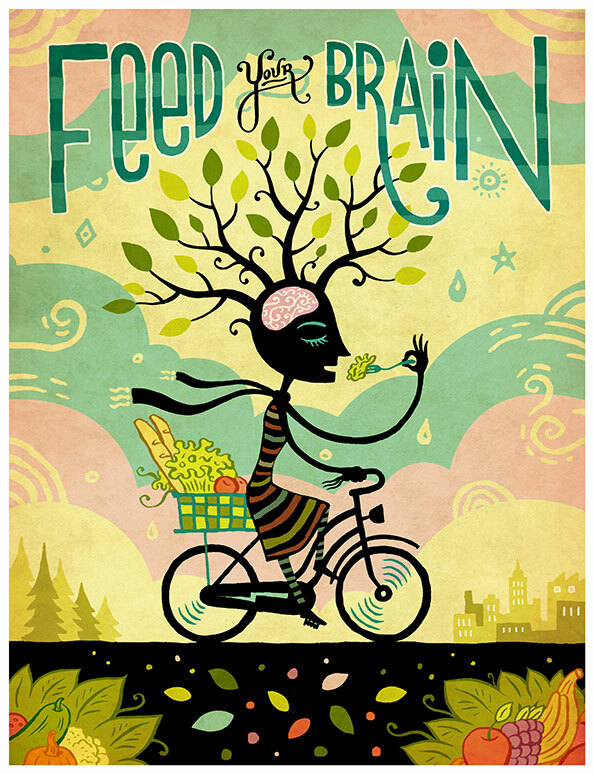 This one is for Vegetarian Times — a real pleasure to do some magazine work again after so many years doing posters and book covers. HD: I do a lot of covers for young adult novels. 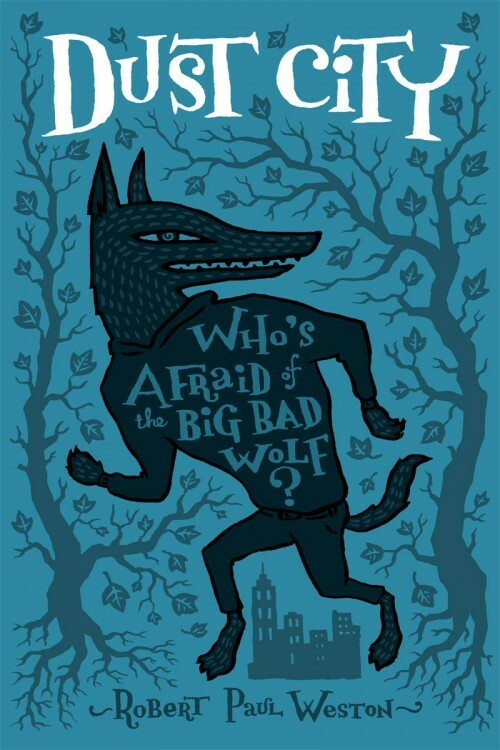 This is one of my favorites, for a really fun book that brings fairy tales up to date in a noir-ish world dominated by powerful multinational corporations that trade in “fairy dust.” The book was published in hardcover with a different jacket, but the client wanted to try a new direction for the paperback — something cartoonish and appealing to kids but still edgy and contemporary. I hope I succeeded! An artistic mercenary with a side of insomniac, his work is omnipresent as only a gun for hire can be. He has left a trail of social ephemera from Joan Jett to Burning Man and from Wired Magazine to Harper Collins. If you need more evidence, go to his website and Altpick page. With fistfuls of cash preferably. There’s always a potential of discovering hidden talents. 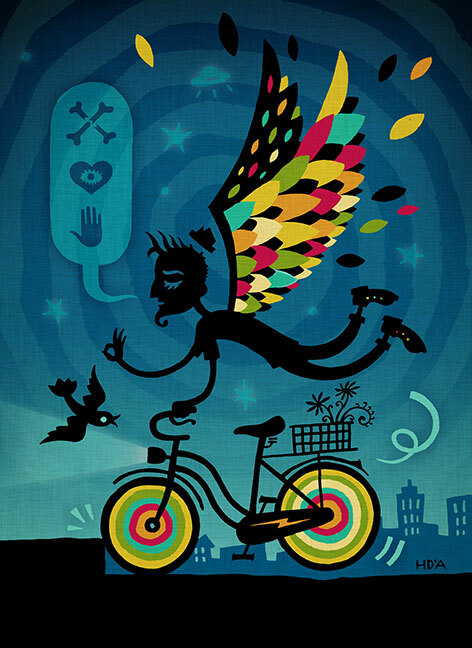 This entry was posted in Altpick, Art, Illustrations and tagged activist, bicycle, book cover, burning man, gunforhire, Hugh D'Andrade, illustrator, political, rock. Bookmark the permalink.